Learn French in Rouen, with our partner school in Normandy, which is located in the chic 'Jardin les Plantes' (botanical garden area). The school has 12 classrooms, a computer suite with free internet for students to use and a library. Easy access, numerous cafés, takeaways and shops close by and the splendid botanical gardens with their open space and fun sporting facilities, like pétanque (French bowls), table tennis and basketball, complete the picture. 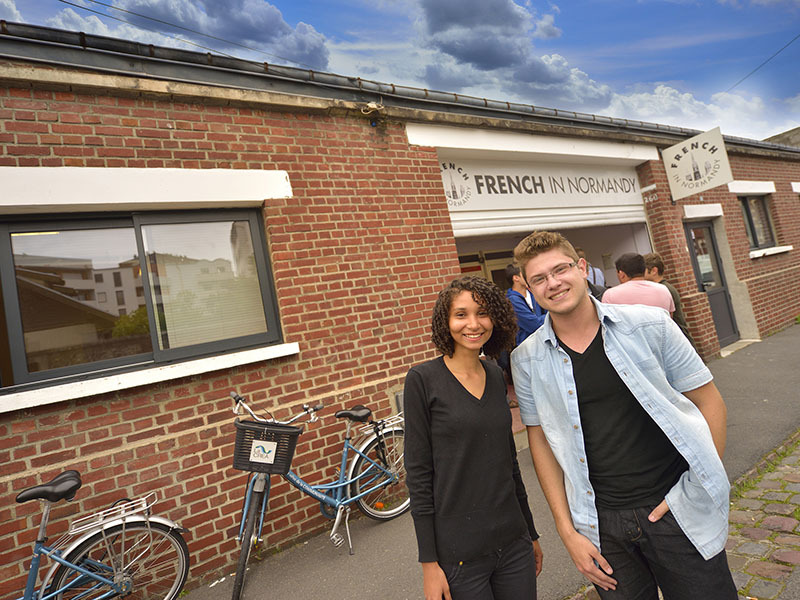 The friendly and welcoming atmosphere in the school makes it easier for students to learn French in Rouen. The language school organizes various excursions and activities to introduce students to Rouen and its surroundings. A few examples of these activities are visiting museums, restaurants, theatre- and movienights, sports and outings. On Saturdays it is possible to participate in day excursions organised by the school. You can visit Paris, which is less than an hour away by train, Monet’s garden in Giverny and the Normandy D-Day landing beaches. If you choose to do the intensive course, you can choose from either 15 or 25 lessons per week. The maximum number of students per class is 12. Classes are taught on 5 different levels and take place between 09.30 and 13.00 hours (including a 30 minute break). In the afternoon you can participate in a free activity/workshop with different subjects to choose from every week, for example grammar, pronunciation, business French, listening, writing and so on, in order to help improve your French even more. The maximum number of students during the workshops is 10. *The timetable is subject to temporary change by the school in periods of high occupancy. Half board includes two meals on week days and full board during the weekend. You will receive your private bathroom in an executive host family. If you decide to book a studio in the residence, it will be more beneficial to do so for a full calender month, as this is more economical for you. Therefore, the price might be lower, depending on the course dates. We would be grateful if you could double check with us first the availability before booking, as the studio's in the residence have very limited availability. The minimum age at the residence is 18 years. Prices of the accommodation in a studio in a family are minimum prices and subject to change; please always contact us to confirm the actual price according to season. A studio in a host family is available for a minimum stay of 4 weeks. The price stated here is for an airport transfer on arrival in Paris Roissy or Orly per person. On arrival in Paris Beauvais € 230 p.p. on arrival at Deauville it is € 230 p.p. In 2019 the school is closed on: 22/04/2019, 01/05/2019, and from 20/12/2019 - 06/01/2020. Missed lessons due to bank holidays will be rescheduled on other days. The Combined course consist of 15 group lessons per week of French (the general intensive course) and 5 private lessons in the afternoon. In the afternoon you can participate in one free activity/workshop with different subjects, for example in listening and speaking skills, book clubs, theatre, film etc.. When you learn French in Rouen, you have the option of doing the DELF or DALF exams. This course consists of 15 lessons of general French per week + 10 lessons in which you will prepare specifically for the DELF/DALF exam. To read more about the DELF/DALF examination course please click here. If you want to complete the DELF/DALF course with an exam, please contact us for advice on the best possible starting dates. Students who want to have all the paperwork or their DELF/DALF exam taken care of before arrival will have to pay a booking fee of € 60,-. The exam fee is not included in the price (€ 150). Not only can you learn French in Rouen but you can also combine learning the language with learning how to cook the exquisite, tasty and unique French cuisine. The course includes 15 lessons of French and 3 cooking sessions on 3 afternoons supervised by a professional French chef. The French & Cuisine course consists of 15 French lessons pw + 3 afternoon sessions of cooking (pastry & bakery), from 14:30-17:00. If you would prefer to learn French in Rouen in your own individual class then you can opt to have one-to-one tuition, which consists of an individual class with 15 lessons per week, thus making it an excellent option for you. The curriculum will be designed to suit you, according to your knowledge of French, your personal interests and/or your line of work. This course is designed for senior students, aged 50 and up, who not only want to improve their French, but also want to spend a pleasant cultural holiday in France enjoying the best of what the Normandy region has to offer. This course has a fixed duration of 1 week and has only two specific starting dates throughout the year (see below). If you are 30 years old or older and would like to expand your French language skills for work and everyday life in a professional environment, the Intensive 30+ course is the right choice for you! The course takes place in a small group with a maximum of 4 participants in your age group. You will receive 30 lessons per week, creating a very intensive learning environment. The teacher training course in Rouen is aimed at all teachers who teach French as a foreign language or any subject in French. With this course, you will refresh your knowledge of French and at the same time expand your teaching skills. The course consists of 30 lessons per week, consisting of 15 lessons of French and 15 lessons of methodology. The programme also includes one afternoon a visit to the national Museum of Education in Rouen. When you learn French in Rouen, you have the option of staying with a host family where you will have a single room, based on half board on weekdays and full board on weekends. Most families live approximately 35 minutes travelling distance from the school by public transport. If you decide to stay with an executive host family you will have a single room and a private bathroom. The accommodation will be based on half board on weekdays and full board on weekends. Most families live approximately 35 minutes travelling distance from school by public transport. The Residence ("Les Estudines Normandie") provides nice studios (with kitchen area and desk) in the heart of the city, at only 10 minutes walking distance from school. The accommodation includes daily breakfast (except on Sundays and public holidays). Would you like to stay with a host family but still enjoy some privacy? Then this might be the perfect accommodation for you! These host family have private studios within there houses including an own kitchen. The studios are fully equiped. The familys live between 20/30 minutes from the school.